I have never blogged about cosmetics before, ever. But this time I would. So if you'd rather not hear me ramble about such an inconsequential subject, you had better stop here. I'm blogging about this because last week on Wednesday, my boss joked about her working me so hard that my eye makeup has all gotten smudged and running down from my lids. How awful must I have looked! But the problem is I look like that by the end of everyday. 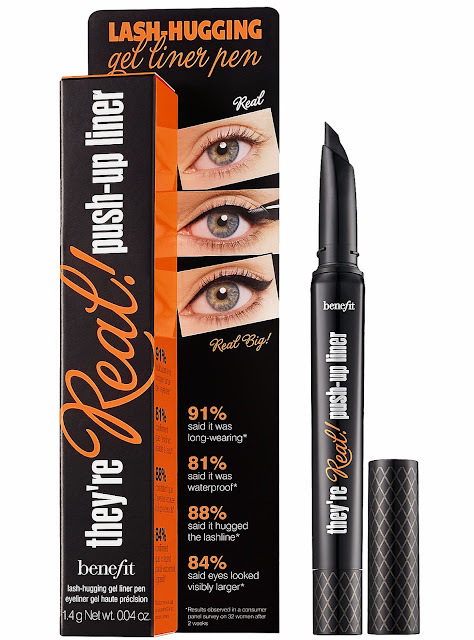 I've always had problems finding a good eyeliner that stays and not smudge by the afternoon. So while I was in the mall today, I thought I'd better do something about it by now and go find something that would work better. And I thought I had better play smarter this time and do some googling, and not trust any sales personnel pushing their products. I found this article I thought might be useful: 10 Best Long-Wear Eyeliners. With that, I "strategised my game plan": I will first visit SaSa, then Sephora and then when all fails, I'll settle for Bobbi Brown and end up spending a bomb there. I strike out in SaSa. They did not have any of the 10 liners in the list. They did carry two of the recommended brands but not any of the recommended products. Then, they recommended me to Benefit's new product, Benefit They’re Real! Push-Up Liner. It is not in the list but I tried it on and I do like it and I bought one. So there, a sales personnel pushing their product and I fell into it, again. I will find out this Monday if this eyeliner ends up running down my face. Post-script (13/07/14): I have used it for little more than a week now and I must say I am very pleased with it. I don't look like a panda in the evening anymore. The only drawback of the product is that it dries out at the tip after a couple of days of non-usage which means you need to run it clean after every use, which I find is rather wasteful, but there is no other way around it.